One very curious discovery this year in Mexico City has been the burial tomb of a Spanish priest named Miguel de Palomares. 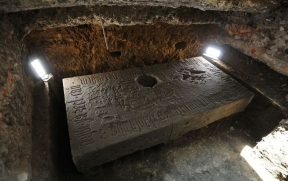 What is curious about it is that he was buried in the floor of a former Aztec temple that apparently was still in existence long after the Spanish conquest of Mexico in 1521. Palomares died in 1542. At that point there were a few churches around in what would become Ciudad de Nueva Espania (New Spain City, now Mexico City), but what comes as a surprise is that the Spanish did NOT destroy all of the Aztec temples and sites as had been believed. Some were still around for a few decades after the Spanish conquest. Were these Aztec temples used as churches before the Spanish built European-style churches on top of them and then permanently buried the Aztec temples? It is an intriguing question that has yet to be answered. One possible answer why the Spanish may have spared a few Aztec buildings for the time being was that the Aztec temples had firm foundations and that the Spanish simply did not have enough building material at the time to completely rebuild what had been the former Aztec capital of Tenochtitlan into a truly Spanish city. Because of this, the temple served as a temporary burial place for this Spanish priest, and may have been used to bury other prominent Spanish conquistadors. We are not sure about that. We are sure that the former Aztec temple was not used to bury Nahua Indians (the descendants of the Aztecs) after the Spanish conquest. In related news, archaeologists have discovered two sealed tunnels in the original Aztec Templo Mayor that maybe burial chambers for some Aztec rulers. The problem is that we cannot be sure—no Aztec ruler’s tomb has ever been found, and normally the Aztecs cremated their dead. Still, it would be interesting to know if there is something in these sealed tunnels.